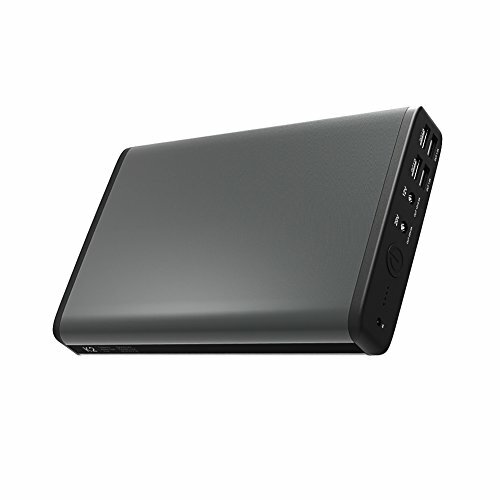 The external battery charger/power bank has 2 output ports to charge laptop,12V fit for 12±2V;20V fit for 20±2V. Plz check the adapter size of your laptop and whether it is included as above. If your laptop turn off automatically for several seconds or minutes, it may caused by overcurrent protection. Please close the screen of your laptop, and then use K2 power bank to fully charged your laptop at first . If you are trying to power a Windows laptop and the battery keeps disconnecting over and over, You need to go into power setting: Find the setting for"Turn Harddrive off after"and set that to NEVER,and in power options DISABLER "Intel Cppc Energy Saving"
How Can i Know Whether My Laptop Will Cause Power Bank Overcurrent or not? Plz check the label pasted on the adapter,if it is more than 90W (DC output current is more than 4.5A). It may cause K2 turn off during charging for overcurrent. 1.ULTRA HIGH CAPACITY POWER BANK-50000mAh/185Wh(TSA are not Approved for Airline Travel/external battery charger) adequate supply for your laptops,phones and tablets,K2 portable battery can charge your iPhone 6 Plus nearly 11 times,iPhone 6 more than 17 times,Galaxy S6 almost 11 times,no trepidation about power shortage, let you charge your devices any time,and facilitating your travel life more beautiful.This This Battery Pack Can Be Recharged in Just 6-8 Hours. 2. MULTI-FUNCTIONAL INTERFACE-It Has 6 Output Ports. One 20V/3A for Laptops, One 12V/2.5A for Digital Cameras, Two 5V/2.1A and Two 5V/1A For most of Smart Phones, iPad, Tablet and More USB-Charged Devices. It can charge several devices simultaneously and fast. laptop connector contains Lenovo, DELL, Toshiba, SONY, HP and etc. make you charge your laptop anytime, anywhere. And the best protecting devices making you use it under more secure and more assured conditions. 3.IMPROVED SAFETY TECHNOLOGY-Constructed with Lithium-ion Polymer, Battery Cells built-in 6 security protections to ensure, make it safety use and 1000+ recharge cycles. Keeping constant power output for charging the devices, also with preventing overcharge/over discharge/overvoltage/overcurrent/short circuit function and restoring protection. 4.LED INDICATOR WITH ALUMINUM SHELL AND EXQUISITE DESIGN-The smallest size currently for 50000mAh Laptop Power Bank in market, Minimum size & lighest weight,exquisite design make it easy to tuck this power bank in your briefcase backpack.The shell is fire retardant,friction resistant/corrosion resistant/extrusion resistant and hardly scratch;More comfortable when using arc design than ordinary angular design,Four LED indicator let you known its real-time status of electric power capacity. If you have any questions about this product by PowerOak, contact us by completing and submitting the form below. If you are looking for a specif part number, please include it with your message.